Wolfmet represents more than 40 years’ experience in the end to end production of tungsten alloy. We excels at turning powder into parts and precision machining tungsten alloy to produce high quality components to very tight tolerances. At 90-97% tungsten, Wolfmet products benefit from the metal’s density and radiation shielding capabilities. Our team of professionally qualified metallurgists and experienced engineers provide customers with support and guidance on manufacturability. We can now 3D print pure tungsten using our revolutionary additive manufacturing process – Wolfmet 3D. It is perfect for the manufacture of high-precision components such as collimators and radiation shields in imaging systems. To find out more visit Wolfmet 3D. We supply Wolfmet tungsten alloys to major aircraft manufacturers including Boeing, Bombardier, Embraer and Textron. We are recognised as one of the World’s leading aerospace tungsten providers. Wolfmet tungsten alloy is the first choice for engineers requiring radiation shields or collimators to focus radiation beams. One key reason for this is Wolfmet’s very high density; in fact it is more than 60% denser than lead, providing superior attenuation characteristics for x-ray and gamma radiation. Wolfmet tungsten alloy provides the perfect solution for ballast weights, vibration damping and associated components in high performance motorsport, in particular Formula 1. Wolfmet 3D is our revolutionary additive manufacturing process. It is perfect for the manufacture of high-precision components such as collimators and radiation shields. We supply Wolfmet tungsten heavy alloys to major aircraft manufacturers including Boeing, Bombardier, Embraer and Textron. We are recognised as one of the World’s leading aerospace tungsten providers. 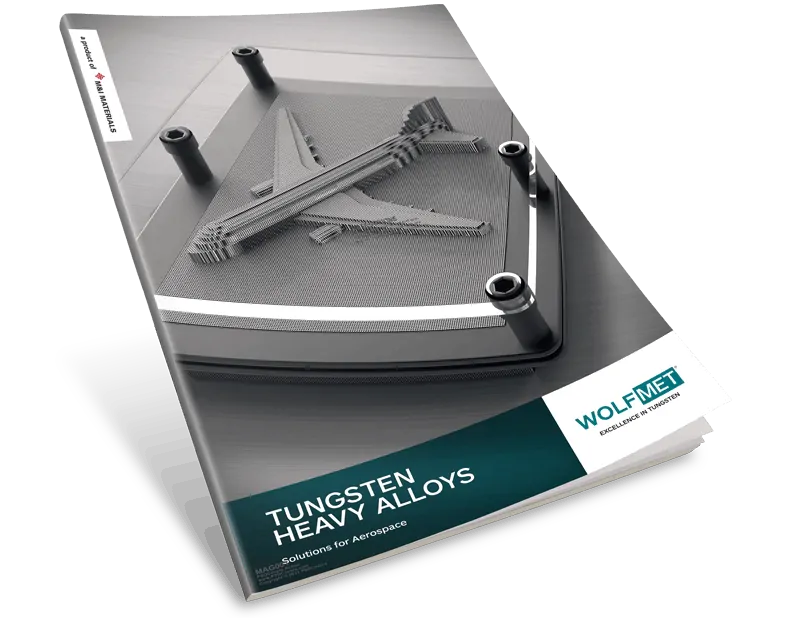 This brochure explains the benefits of using Wolfmet tungsten alloys in aerospace applications.